I’ve just added our very first scan to the gallery. Thanks to Lorna for sending it in. You can find a transcription of the article in our Press Archives. Welcome to Gemma Arterton Online! Welcome to Gemma Arterton Online, your newest source for Gemma Arterton! After a month of having up only a temporary site and gallery, we have opened the full version of the site. Gemma Arterton Online is owned and operated by Riikka, Mariana and Mycah. We’ve recently discovered Miss Arterton and decided to build this site as a tribute to this young actress who managed to captivate our attention like a veteran actress. We tried to make this site as complete as could be, but, at the moment, there isn’t much about Gemma out there. 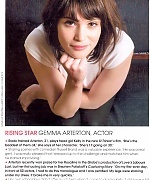 Please stay tuned because Gemma Arterton Online will keep growing, just like Miss Arterton’s career! We hope you enjoy this tribute we’ve built for the star on the rise. Sony announced today that principal photography has begun on the 22nd Bond flick, tentatively — and creatively — titled Bond 22, at London’s venerable Pinewood Studios. Daniel Craig returns as the blonde Bond, accompanied by Casino Royale co-stars Judi Dench, Jeffrey Wright and Giancarlo Giannini. 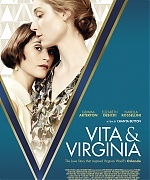 Newcomers include Gemma Arterton, Mathieu Amalric (The Diving Bell and the Butterfly), who plays Bond’s Gallic nemesis, and Olga Kurylenko (Hitman), who plays the lead bond girl Camille. Kurylenko, born in 1979 in Berdyansk, former USSR, recently co-starred in Hitman and with Elijah Wood in a segment for Paris, je t’aime. She began her film career in France in 2005. She received the certificate of excellence award at the 2006 Brooklyn International Film Festival for her performance in L’Annulaire. To learn more about the new Bond girl addition to the Bond 22 casting, head over to Olga Kurylenko Online. British newcomer Gemma Arterton has been cast as the Bond girl for the latest installment of the James Bond franchise now filming in London for Columbia Pictures and MGM. The film’s production companies late last week said Arterton will play Fields in the Marc Forster-directed movie, which has the working title of Bond 22 and stars Daniel Craig as Agent 007. The 21-year-old Royal Academy of Dramatic Arts grad joins a cast that includes Craig, Judi Dench, Giancarlo Giannini, Mathieu Amalric, Jeffrey Wright and Jesper Christensen. The internet is currently abuzz with rumours that St Trinian‘s actress Gemma Arterton will be the next Bond girl, as reported in several tabloids today. Though we’d encourage you not to believe anything everything you read in the red tops, Empire has learned from a source who’s in a position to be absolutely sure that this casting is 100% true. What’s not absolutely certain yet is whether Arterton will be the main Bond girl, like Eva Green in Casino Royale, or one of the peripheral lovelies like Caterina Murino and that other one. But what we’re hearing suggests that she’ll be in a fairly major role. The storyline for Bond 22 ? or 007 as it’s rumoured to be called after Daniel Craig accidentally slipped up slightly on a talk show ? is, of course, still under wraps, so there’s no knowing what her role might be. Arterton’s certainly got the looks for the part, though we can’t judge her acting skills yet as we’ve yet to see St Trinian‘s, her first movie. But we do know she’s lovely.